For the first time in our neighborhood, enjoy the change of seasons and celebrate autumn in the streets of Rosslyn during Harvest Fest! 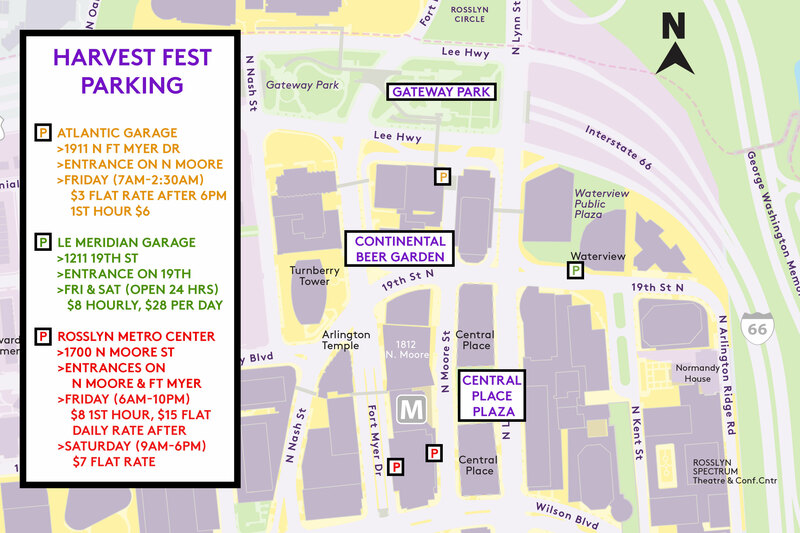 Parking Map with full location, pricing, and entrances available here. TWO DAYS - THREE LOCATIONS - LOTS OF FUN! 6-9 p.m. - FREE Friday Night Scavenger Hunt for Adults! (*See below for information on how to participate). It's a chance to win great prizes! 6-9 p.m. - Halloween Festivities: Beer Garden, Inflatable Corn Maze, Scavenger Hunt, D.J. 10 a.m.-3:30 p.m. - FREE Trick or Treat for Families! (*See below for information on how to participate). 2 p.m. - Pets and Kids Parades in Costumes! 3-5 p.m. - Bats in the Belfry. Local D.C. bats will play spooktacular tunes (Harry Potter, Thriller, Ghostbusters...) on the 50-bell Netherlands Carillon + pumpkin carving. All ages welcome! Pick up your FREE bag/pumpkin basket either at the Rosslyn info cart at Central Place Plaza or at the Rosslyn tent at Gateway Park. You will get a map of all the stations where you can stop to get free treats and collect golden tickets to redeem for prizes at the end of your hunt! Prizes include wireless headphones, Kindle Fire HD tablets, restaurant gift cards, drink tokens for the beer gardens at Harvest Fest, kid prizes and more. Make sure to wear a great costume and stop by ALL the stations: You might get even more treats! Supplies are limited so make sure to come early!